Most folks who have experienced Chinese food only in Chinatown restaurants haven’t the slightest idea that smoked foods are a big deal in the motherland. It’s amazing, but just about every region has its own take on smoked meat, fish, and poultry, and they all have tiny variations that act as clues to where that dish originated. 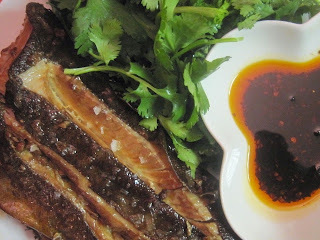 Sometimes it’s a huge sign, like lamb in Henan near the desert regions, and in other dishes the signposts lie within the potpourri of spices that perfume the marinade or the smoking mixture or even both. Where they almost all are alike is that the animal is first cooked — usually by steaming or braising — while smoking it over tea leaves, rice, and sugar is a final fillip that seasons and colors, but no more. This fish is pretty unique in that the fish is actually cooked over the smoke. 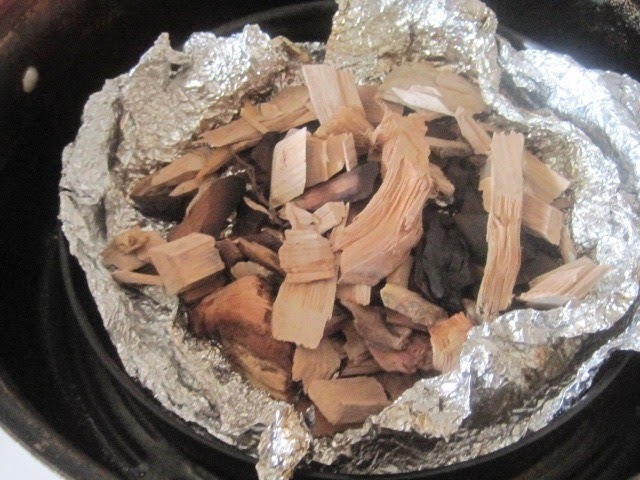 To achieve this, slow-burning wood chips are used instead of the tealeaves and rice, which ignite quickly once they have sugar as a starter, and so heats up the fish slowly while seasoning every morsel. (Here's the link to directions on setting up a homemade smoker.) The name of this way of cooking says it all: shengxun, or “raw smoked.” And if you get your hands on a fish with a really buttery texture, like sablefish, it will turn into an amazingly creamy mouthful tinged with a healthy perfume of smoke. 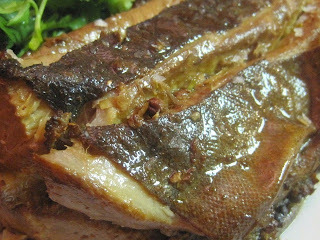 You can make this well ahead of a dinner party by marinating the fish and then freezing it. The smoking process can be done without much effort, but even then, they can be done a day or two in advance. The fish only needs to be heated up before serving. 1. Start this at least a couple of hours before serving. Clean and scale the fish, remove the gills and fins (keep or remove the head and tail, depending upon the size of your smoker and fish), and rinse it thoroughly under cool running water. 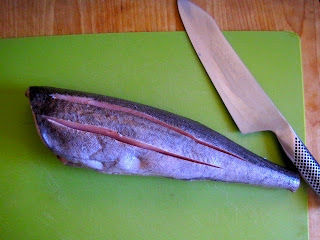 Pat it dry with a paper towel, and then cut two long gashes down the sides of the fish parallel to, and about one inch from, the backbone. 2. 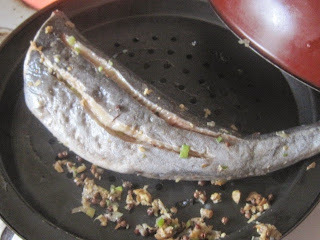 Mix together the grated ginger, green onions, Sichuan peppercorns, and salt, and then rub a third of this mixture respectively into the insides of the fish and into both sides, paying particular attention to the long gash. Place the fish into a large, clean plastic bag and pour the wine into the insides and onto both sides of the fish. Tie the bag shut, place it on a plate, and refrigerate it for 2 to 8 hours to marinate. 3. Prepare your smoker, lining the bottom with some foil. Spray the grate that lies over the center of the smoker with oil. 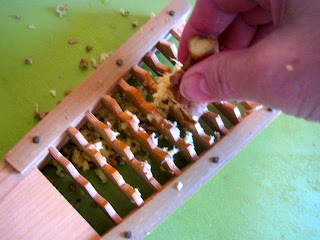 Scatter the dry wood chips in an even layer on top of the foil. Place the covered smoker to the rear of your stove, turn the fan on high and open some windows for cross-ventilation, and turn the heat under the smoker to high. 4. While the smoker is heating up, remove the fish from the bag and knock off all of the aromatics from both inside and outside the fish, including the gashes. 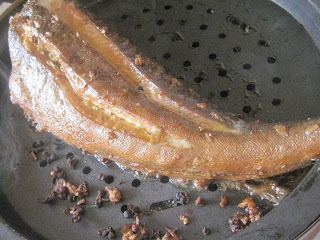 When the smoker starts to have little tendrils of smoke come out of it, place the fish right-side up on the grate, immediately cover the smoker, and lower the heat under the smoker to medium-high. Smoke the fish for about 25 to 30 minutes, or until it is almost — but not quite — done. 6. While you are waiting, prepare the various condiments: combine the vinegar and ginger in a small bowl, and use other bowls or saucers of appropriate sizes to separately hold the cilantro, chili oil, and salt. 7. Remove the fish to a serving platter. Just before serving, heat the sesame oil in a wok until it starts to smoke, and then pour the hot oil all over the fish. Serve it with the condiments. To eat, use chopsticks to pluck off chunks of the fish and dip them in the various sides as desired. The best fish for this type of preparation is one with a buttery texture, like a small sablefish, amberjack, sea bass, or yellowtail. Get one that fits your smoker, so if you need to settle for a fish that is around 1½ pounds, just adjust the seasonings accordingly. The main thing you want to pay attention to is the amount of salt, as extra ginger, green onions, etc., will not vastly change the flavor.